Continuing its affordable Champ series of handsets, Samsung has today announced the launch of the Samsung Champ Deluxe Duos, its latest Dual SIM phone. 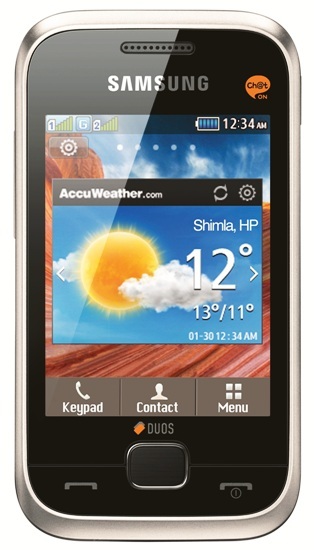 The Champ Deluxe Duos (C3312) has a 2.8 inch display which is the largest touch screen in its class. The handset comes with Samsung’s in-house TouchWiz UI and features apps like Facebook, Twitter,Yahoo, MSN, GTalk, a Virtual QWERTY keyboard, Hindi language input, dual-SIM dual-standby support, and also Samsung’s multi-platform messenger ChatOn. Mutlimedia features include a 1.3MP camera, MP3 player, FM radio and 3.5mm audio jack. The handset also comes with unlimited Free Music and unlimited Free Games along with hundreds of Smart apps that have been made available on the phone. Also, Airtel is offering a 2GB free data offer. The Champ Deluxe Duos is priced at Rs. 4,790 and is available all over India.